This year, I had the opportunity to travel across the country and meet with many relentless and determined individuals who, with a little support from their communities, have fought for themselves and overcome barriers to employment. One of those individuals was Charles Jackson, the 2016 Goodwill® Achiever of the Year. After spending more than two years in federal prison, Charles was released and faced challenges securing meaningful employment. He didn't give up on himself. At the advice of his sister, he visited Goodwill Central Texas in Austin. Charles received training from the Austin Goodwill and earned a job as a production supervisor for its retail store. He continued to work hard and grow as a leader. He took every class offered by the Austin Goodwill and rose from a production supervisor to a clerk and then to an assistant store manager within two years. Today, he is a dedicated store manager. Charles fought relentlessly to find purpose in his work. Charles' story is inspiring, and there are hundreds of other success stories of people who overcame challenges and found meaningful employment. Consider Shawnteal Turner, who grew up in an abusive household. By adulthood, according to Shawnteal, she was "hanging out with the gang members on the street corners...not really accomplishing anything." After a friend encouraged her to go to a job fair at Seattle Goodwill Industries, Shawnteal joined Goodwill's Youth Green Corps and turned her life around. Read more about Shawnteal's story here. There is so much people can accomplish with a little support and investment from their community, including job training programs offered by Goodwill organizations. However, job training is just one part of the solution. Goodwill organizations are also proud to partner with local businesses on job placement and recruitment services to address the talent shortage that is a real concern for many businesses. Today's economy is so different from just 10 years ago. Ten years ago, there were no app developers, and the sharing economy was barely a blip on our radar. Entry-level credential requirements have changed too. By 2020, 65 percent of all jobs in the economy will require post-secondary education and training beyond high school. Here's another big difference: According to a survey by The Manpower Group, today, 46 percent of American employers reported difficult filling jobs, compared to the 22 percent of employers in 2008. That number may come as a surprise considering the national unemployment rate remains around 5 percent. The disconnect between open positions and unemployed individuals looking for work is due in part to the skills gap and skills attainment. Technology and business needs are changing rapidly in all fields. Too often, education and training programs haven't kept up. As Sunny Ackerman, the vice president and general manager of Manpower U.S. explains, "In many ways, the growing talent shortage reflects an issue of quality versus quantity. The challenge is finding people with the right skills and experience to do the work." According to the same Manpower survey, skilled trades (including construction and welding) top the list as the hardest jobs to fill in the United States, followed by drivers. Skilled trades and driving courses are just some of the many programs offered by Goodwill organizations across North America. With more than 7.8 million people still looking for work in the United States and Canada, jobs are important to help provide opportunity and purpose for people in your community. Every 23 seconds of every business day, a person served by Goodwill earns a good job. 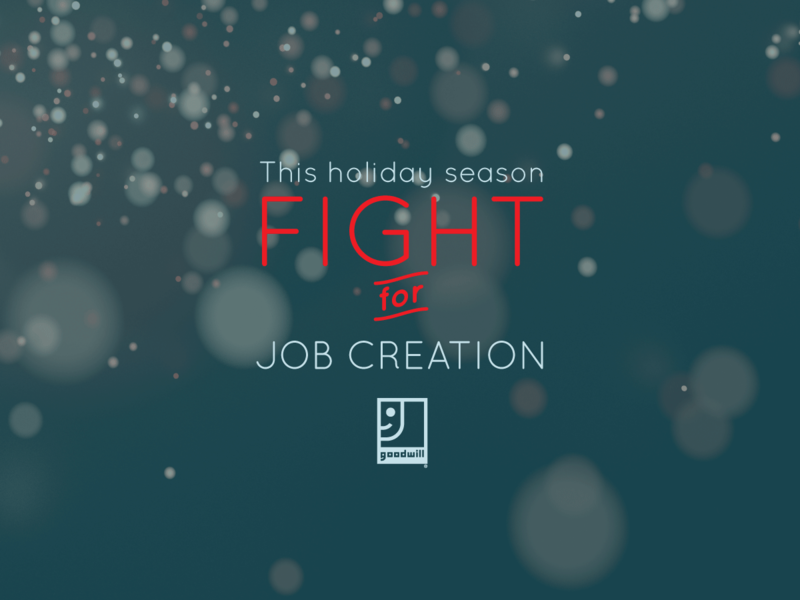 In the spirit of resolutions, I challenge you to join the fight and think differently about what Goodwill can do for the people looking for jobs in your community. Consider Jennifer Allshouse's story. She had never worked in construction and had some uncertainties about entering a new field. Jennifer received the support she needed from Goodwill Easter-Seals Minnesota to succeed in its construction training program. She fought for her opportunity to try a new job profession and she is now one of only five women who are pile drivers in Minnesota. If Goodwill is the launch pad, then employers are the landing point. Goodwill Easter-Seals Minnesota was able to provide Jennifer with the training and resources, but it couldn't have provided her with a job in construction. Local partnerships with construction companies made that job creation happen. Through collaboration, we can fight the talent shortage and unemployment in our communities. Just as Charles, Shawnteal and Jennifer fought for opportunity and purpose on their work, you can fight for job creation. Join the fight as a business owner: partner with your local Goodwill organization to fill open jobs. Join the fight as a community member: give a financial gift or donate your stuff today to create jobs and support your community. 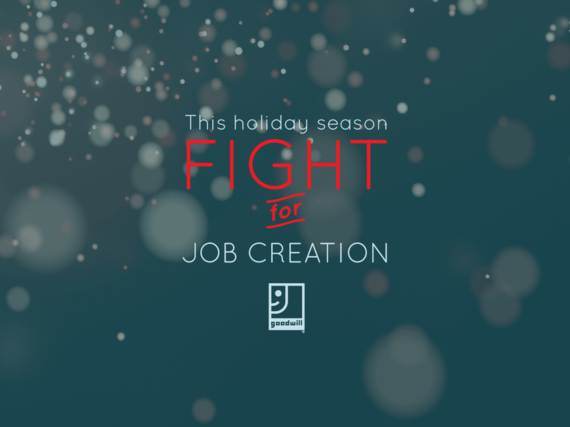 Each of us can join the fight for job creation and make a difference this holiday season.